Guess they're sticking with "Emma's a bad guy". On the plus side, Mystique in business attire is something I never knew I needed until now. Well...they're clothes...which is progress on her part. I'm okay with that actually -- I don't think that anyone's done anything too interesting with her since Whedon finished his run on Astonishing X-Men (although you could probably say that about a lot of characters in the X-Universe). Now I'm no fashion expert, but does "jacket with no shirt or bra" qualify as business attire? For the Hellfire Club? Most certainly. By Hellfire Club standards, she's dressed like a nun. 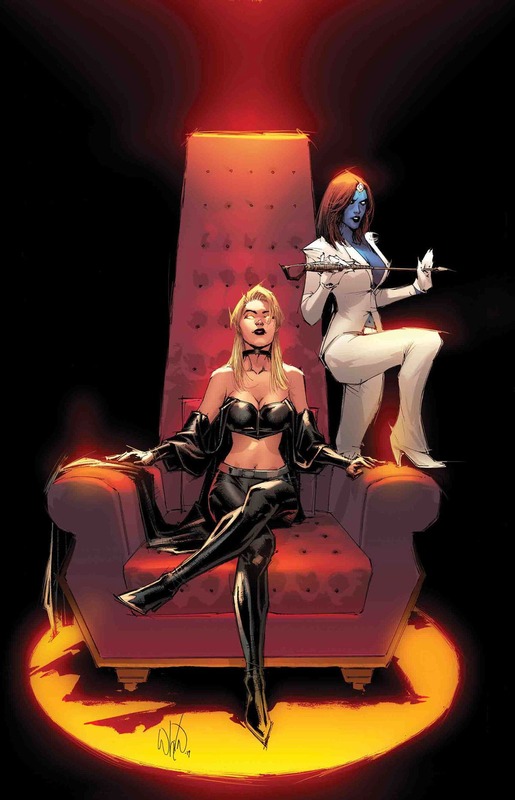 Somebody call up Greg Land so he can draw Emma and Mystique in naughty nun attire, stat! Land? Surely Cho or the Dodsons would be a better choice? At least if we don't want to see Ultimate Susan Storm times two dressed as a nun. Well, now that Scott's back, maybe she'll have a better motivation than "my boyfriend's dead"? Remember when an alternate universe Courtney Ross, Sat-Yr-9, was part of the Hellfire Club? Oh, just me? Never mind then. I remember that coming up briefly in X-treme X-men, I think. But X-treme X-men at that point seemed to be a greatest hit parade of Claremont characters and storylines I wasn't particularly familiar or invested in, so I'm not sure. The London Hellfire Club had their Inner Circle in Red and Black, based on old-school chess notation, which used red and black ink for the opposing sides. I don't remember Sat-Yr-9 ever being a member though. Margali Szardoz was their Red Queen, and mutant named Emma Steed (who first showed up as "Damask" in Age of Apocalypse) was Black Queen. Sat-Yr-9 was part of the New York branch during Claremont's Excalibur just before House M torpedoed everything in the X-books. She tried to take Emma's white queen spot but failed and they ended up sharing it with her working with the new Lord Imperial Sunspot while Emma was just as always Emma. She was also still hanging around with Roma and advocated for nuking 616 after it yet again threatened all of existence. She was going to do it until Plot contrivance aka the missing Braddock sibling destroyed their ability to destroy alternate realities. So Brain was allowed to have a chance to fix things while they fixed the destroy all realities thing. Are those actual clothes Mystique is wearing or part of her shapeshifting? Probably the latter, they are most of the time. I vaguely recall at one point Mystique having a special bodysuit (unstable molecules, perhaps?) that she could shift with her, but I generally assume that anything she isn't planning on taking off in front of someone is an extension of her powers rather than the garment it appears to be. Way way way back in her early days, the skulls she wore on her belt were like, shapeshifted grenades and such. You know I can't recall ever seeing that in any of the comics. I remember it quiet clearly from some of the trading cards as a it of trivia but I don't recall ever seeing it in action in the comics. Considering how grimdark X-Men have gotten I was expecting Emma to be in prison, bald, and getting potentially violated by prisoners. Also, that looks more like Illyana than Emma, I think it's the hairstyle. is it just me or would putting the x-men in their one universe separate from the rest of marvel solve a whole mess of problems?